Sangean’s new PR-D19 AM/FM Stereo radio is the logical upgrade to their already popular PR-D18 portable radio I reviewed several months ago. At that time I was impressed by that model’s overall performance and I won’t keep you in suspense…I am happy to report that the PR-D19 features superb FM reception and somewhat enhanced AM reception compared with the mono model. There are also a few additional features which make the PR-D19 an even more desirable upgrade than the addition of stereo alone might suggest. But for those not familiar with the earlier model let me first describe the new radio for you. The PR-D19 lists for is $99.95 but I found it available for $69.95…an optional AC adapter is available for $14.99. On the surface it is a simple AM/FM Stereo portable radio. 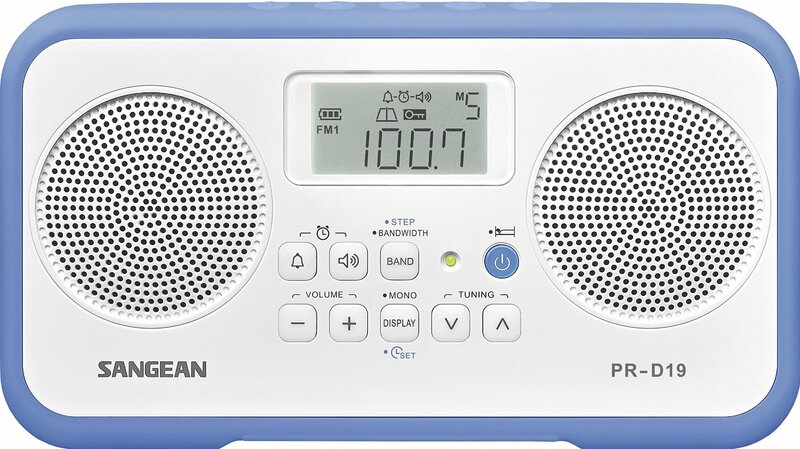 As with many other Sangean models it does not appear to cater to fans of complicated techie devices but is a rather simple and straight-forward radio that anyone should be able to operate with a minimum of fuss and without having to read the owner’s manual. 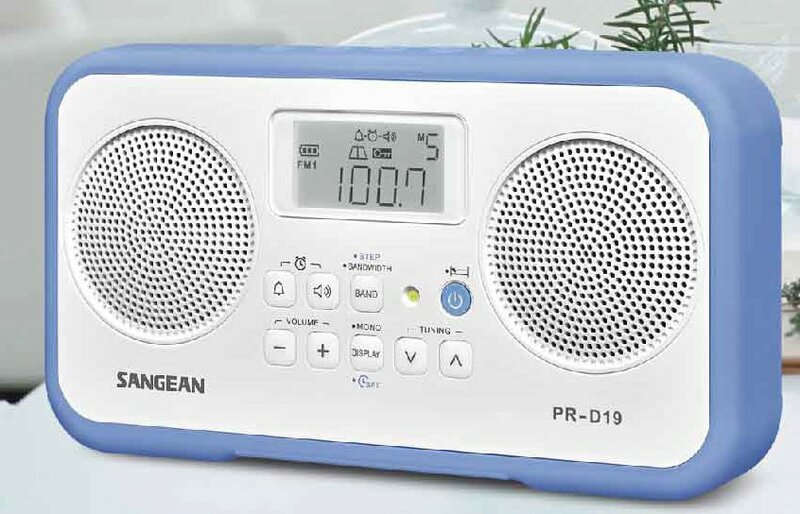 Sangean’s ingenuity becomes evident as you use the radio and I do recommend reading the manual for the PR-D19 has additional capabilities which you can take advantage of if so inclined. The PR-D19 sold in the US covers AM 520 -1710 KHz with 9 or 10 KHz tuning steps and FM from 87.5 – 108 MHz with 100 or 50 KHz steps. There are other versions for other parts of the world with expanded FM band coverage. It is available in two colors: Blue/White and Black/Gray, with a rubber surround that adds a sense of ruggedness to its already solid feel. DC In Jack – No adapter is supplied but the jack is labeled 6V/1A center pin positive. An optional AC Adapter is $14. Using The PR-D19 is, as I said, simple and unintimidating as an AM/FM radio should be. Press Power, use the Band button to select AM1, AM2, FM1 or FM2 and off you go. The Volume Up/Down and Tuning Up/Down buttons are clearly marked. Presetting stations is as easy as an old car radio. Tune in a station, press and hold one of the 5 preset buttons on top of the radio until a beep is heard and that station is now stored on that button. One minor quibble is that those preset buttons on the top of the radio are rather easy to hit by mistake as you pick up the radio. Also there is no signal strength indication nor is there RDS on FM. However considering the price of this radio I think it has a lot to offer – namely, excellent FM and very good AM reception with decent audio for this size class. I’m happy to report that the PR-D19 did even better…those digital noises seem to have been further suppressed and were not evident at all in my tests. And overall AM sensitivity was a bit better as well…I’d say about 10-15 percent better sensitivity across the AM dial. It still rates as ** (Two Stars) in the Mega AM Shootout list but is now at the top of that list with performance more sensitive and less hissy than Sangean’s flagship ATS-909X or Tecsun’s PL-880, PL-680 or PL-660. Pretty amazing! There are also dual bandwidths available and if needed the narrow bandwidth position will greatly increase the PR-D19’s selectivity to help isolate a weak signal adjacent to a stronger interfering signal. With most stations you will be able to separate adjacent signals even in the wide bandwidth position unless the interfering station is much stronger than the desired one, but the available narrow bandwidth will help in tough situations. FM Performance: Here the news is even better. The humble little PR-D19 was close to the best portable radios I have on hand for overall FM reception. I compared it with the PR-D18, CC Radio 2E and those three Tecsuns I mentioned above, along with the Eton Satellit, which have all proved to be very capable FM receivers…especially the CC-2E. The PR-D19 was almost as sensitive as the best and was also among the most selective, even in its wider FM bandwidth position. I scanned the whole FM band with many adjacent signals and many channels with multiple signals available by moving the radio or antenna and the PR-D19 heard almost as many stations as the best of them. The PR-D19 also has a relatively rare feature…Dual Bandwidths on FM. Unlike AM, in FM a narrower bandwidth does not reduce high frequency response…it does not muffle the sound. Instead it results in slightly greater distortion, but in return you get increased selectivity. In portable terms this increased distortion is seldom evident. And in real world use the PR-D19 is so selective on FM (I easily separated every adjacent channel signal I could find…in fact it passed my most rigorous FM selectivity tests with flying colors), that you may never need to use the narrow setting on FM. It’s effect was also very subtle, but it’s there and is a bonus. Aux In Jack: Makes the PR-D19 a cool little amplified speaker for any audio device. Sound, The Good and the Bad – First The Good: Pretty much what you might expect of a radio this size…certainly no boombox but pleasant enough to be enjoyable, with minimal stereo effect from the tiny, closely-spaced speakers. But as radios of this size go the sound is fine and compares well with radios like the Eton Satellit and Tecsun PL-880 which are widely recognized as having good sound in this size class. It has good audio volume and sounds a bit crisper than the PR-D18. However there is no tone control. The Bad: Unfortunately the audio available at the headphone output jack has a heavy bass boost which is evidently built into the amplifier to enhance the sound of the small speakers. This makes the sound extremely bass heavy when listening through most headphones or an external audio system. It’s especially unfortunate given the excellent FM performance of the PR-D19 which would make it a great budget FM tuner…if you have tone controls you could, of course, tame that bass boost. But the other portable radios I’ve mentioned here all have flatter frequency response – more accurate audio at their headphone output jacks. There is no Line Output jack. 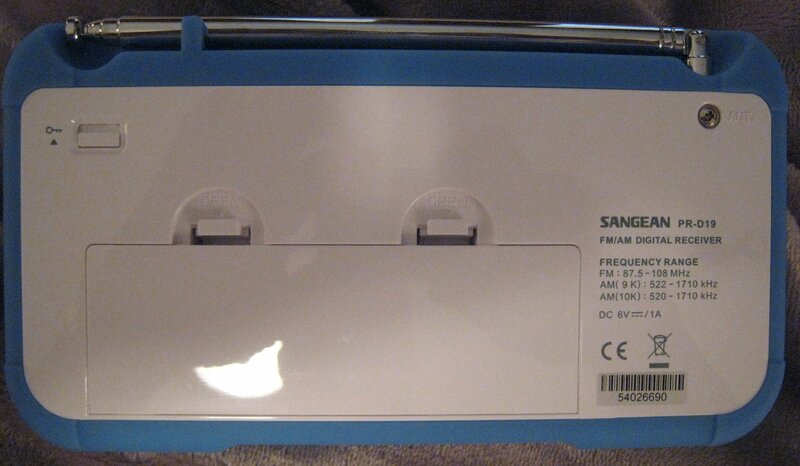 Bottom Line: The Sangean PR-D19 is a great little AM/FM radio. Even though it is too small to give much of a stereo effect I still find it to be a real improvement over the PR-D18 with its slightly better audio and improved AM performance. And its FM performance is no less than phenomenal…almost as good as it gets these days. Just don’t expect to use its headphone jack unless you like really bass-heavy audio. But other than that caveat it is highly recommended!